A Premier League footballer has been given a suspended prison sentence after he pleaded guilty to possessing a fake driving licence. 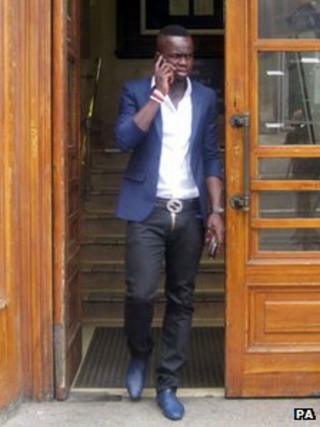 Newcastle United midfielder Cheick Tiote admitted buying a fake Belgian licence for 15,000 euros (£12,800). Tony Hawks, prosecuting, said Tiote tried to use the fake document to apply for a UK driving licence from the DVLA. At Newcastle Crown Court, he was handed a seven-month sentence suspended for 18 months and 180 hours of unpaid work. "The licence was a very good forgery but there were a number of features that showed it was a forgery," said Mr Hawks. Judge James Goss QC told the Ivory Coast international that his guilty plea had "saved him from an immediate prison sentence". He added: "In that way you will be punished and I have no doubt that, using your considerable talent, you will be able to assist others in the community by encouraging them and passing on your skills that way." He pleaded not guilty to a charge of driving with no insurance and that will be dealt with at a magistrates court. No evidence was offered on a charge of making a false statement to obtain insurance, and a verdict of not guilty was given. Born in the Ivory Coast, he moved to Belgian club Anderlecht in 2005 and then played for Dutch side FC Twente before signing for Newcastle in 2010.